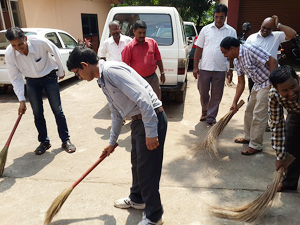 Mangaluru , May 12, 2015: According to a media release, the 15 th of a series of Sunday Swatchh Bharath (cleanliness) drives in the city, volunteers under the banner of Ramakrishna Mission cleaned the area near Government Wenlock Hospital and Milagres Church here on May 10 Sunday. Trash and garbage in and around the hospital and Milagres circle was cleared and even the old bus stand opp the hospital gate was cleaned and painted. The road divider near Hotel Taj Mahal was cleaned, painted and several posters with messages about Swachh Bharath were placed to create awareness convey a message among public. Road sign boards were painted and set right. Additionally, from what was done last week, a team of volunteers erected cement platforms around trees near the Deputy Commissioner’s office, providing seats there for waiting public. Volunteers of the National Service Scheme, employees of HDFC bank and well-wishers of the Ramakrishna Mutt took part generally.